Last June, I had the opportunity to visit American Standard’s New Product Design Center in Piscataway, NJ. During that visit, as part of a small group of bloggerazzi, I was presented with an OutReach CenterSet Lavatory Faucet in chrome. Now, I have been given a handful of products over the last year. And my policy with these “samples” is pretty simple. If I don’t have a real, actual need for them, I try to find a home for them . . . above all, somewhere within my immediate circle. With this Outreach, I knew I really didn’t have a space for it in my own house. Still, I held onto it, hoping perhaps (not really) that our rental property would have a need for it one day soon. But when my wife started work on her flip rehab late last year, “Oooo!” I thought so I finally offered it up to her. 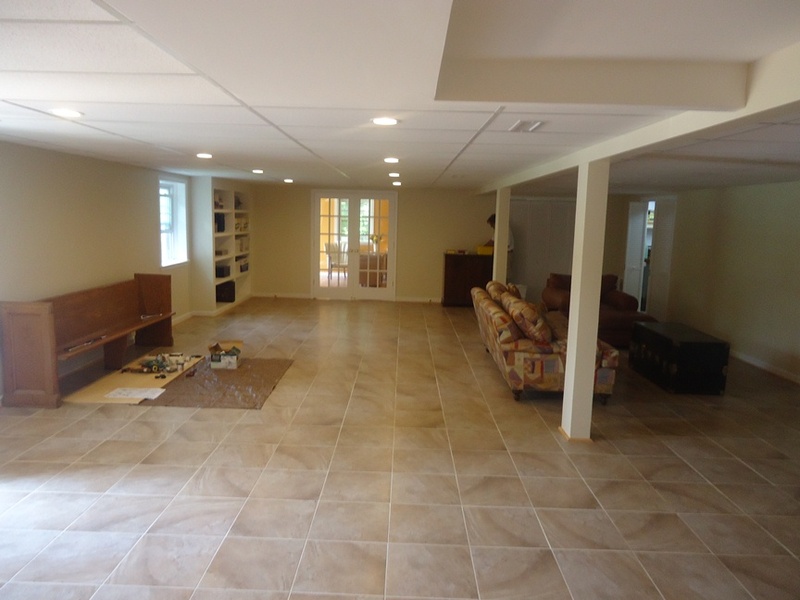 When I learned that my dad and his lovely wife Joan were moving forward with their basement remodel, I offered it, then, to them. I told Joan that this particular faucet was what is known as a centerset faucet. That is – the faucet is made for a top that has a 4-inch space (total) between the holes that are drilled in it. Joan jumped on it, and in a matter of days, she emailed a vanity that she had selected. Go figure, old friends – St. Paul Home Products. A Vanguard 36 in. 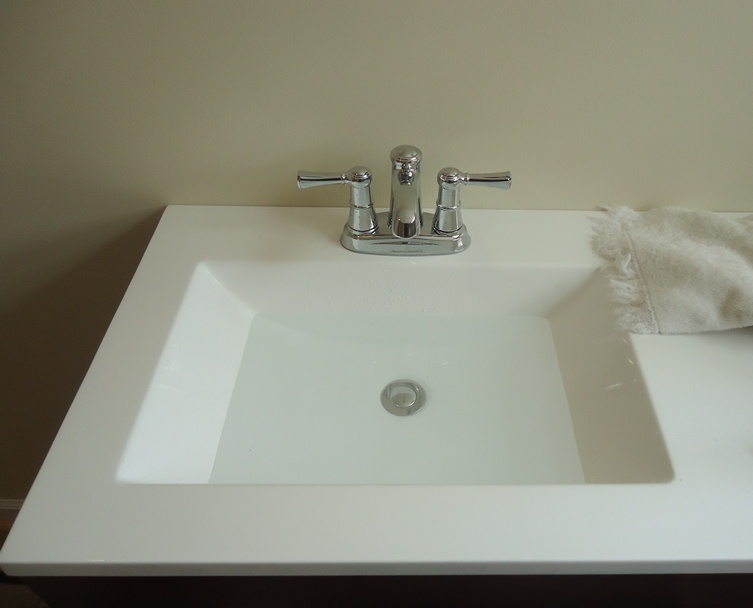 Vanity in Hazelnut with AB Engineered Composite Top in White. Yep, it would work. Now, you may remember, a few week back — I worked with my RL friend #diyDaveW to install a St. Paul vanity – a bathroom remodel. But no . . . a different St. Paul model. If you happened to check that post, and decided to drill down even further, you might have caught some of the four 4-minute videos I produced from that session. In those videos, I’ll admit — I kinda skimmed over the faucet install. So, you see, here now was kinda like a make-up. 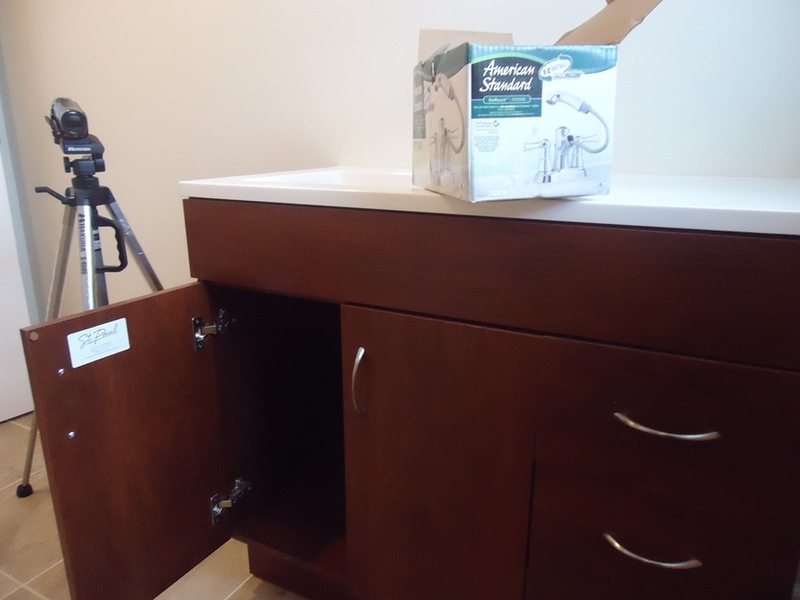 When working with a new vanity, not yet installed, it is best practice to mount the faucet (and the pop-up drain) to the top prior to setting it on the vanity cabinet. 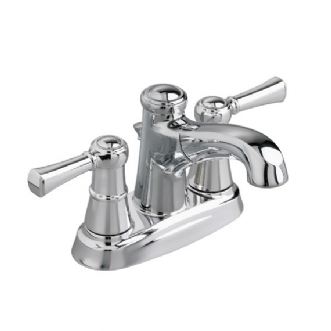 While the American Standard Outreach is much like any other lavatory faucet, it does have two features which make it unique. First, and as the name would suggest, this faucet is a pull-out faucet. You know — it has a pull out head, like one you might find on a kitchen faucet. 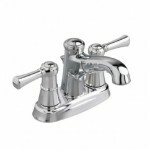 Second, and like many (if not all) of American Standard’s bath faucets, it is equipped with a pop-up assembly the company has branded as Speed ConnectTM. It is billed as having 1/3 the parts (which it does) and as also taking 1/3 the time to install. A time-saver certainly, and maybe more so after one ramps up on this type of configuration. I found that if you install the pop-up as I did, with it essentially lying on its side, you need to factor gravity (and the weight of water) into the equation before you can decide if adjustments are needed. Unlike more traditional set-ups, this at first confused me and slowed me down. Did it take me 1/3 the time, this my first time? No. But I do suspect I will be faster the next time I try. And I hope maybe that the vid above might help if you install an American Standard faucet with Speed Connect. You know, my wife did eventually circle back to say, “Do you still have that American Standard faucet?” Ummmm . . . .
I’ll mention, too, and like the plumbing in this house hadn’t taunted me enough (I did some work in Joan‘s bath a few years back), I hooked the whole thing up on the day of the shoot, and maybe you happen to notice the point in the video that I left off — releasing the stopper, Absolutely Nothing! The sink wouldn’t drain. Cursed! … It turns out there was some small blockage in the drain line that was addressed with a plunger … a few days later. Ha! My apologies for skimming over the under-the-sink connections in this video, maybe I circle back and provide that footage later. As a note of good practice and benefit for our environment, please always replace a faucet’s aerator once you have completed your initial install. 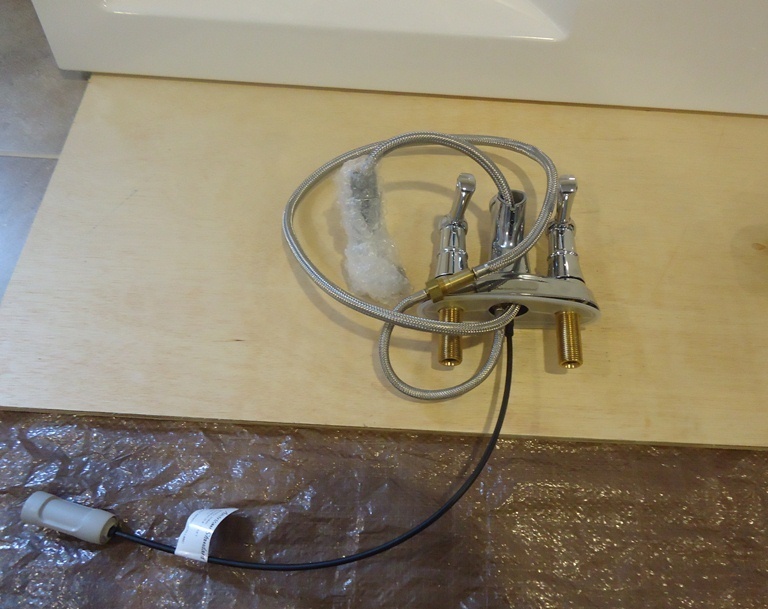 I am of the habit of removing it during installation, especially in cases where new supply lines are installed. Thanks out to my dad and Joan for allowing me to be a part of their project. 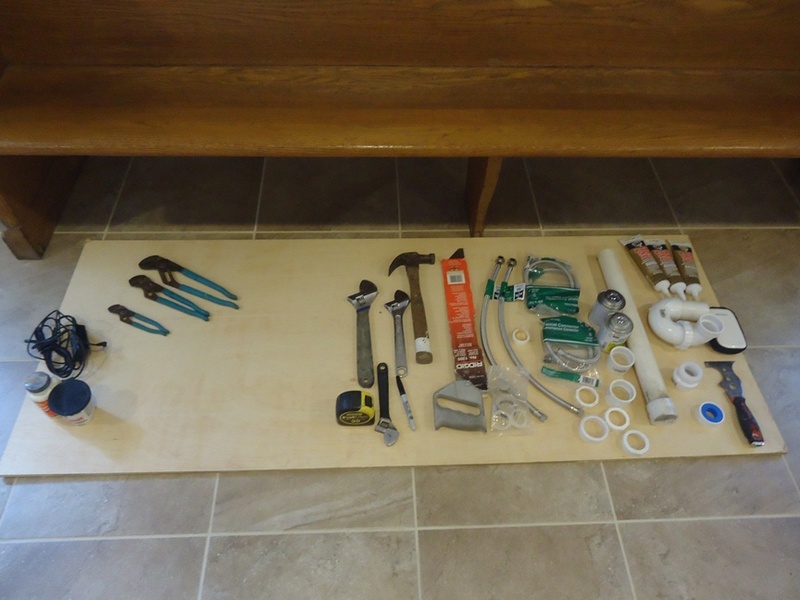 For additional information on installing Faucets, including another video – please see also my article Rental Refresh. Note: While this video was made on my personal YouTube account, we’ve since moved to an official Building Moxie YouTube Channel. Please Subscribe there.